I was one of the people patiently awaiting for Stardew Valley to make it to consoles. Whether it was on my Vita or PS4, I was ready to dive head first and get lost in the charming pix-elated world. Full disclosure, I was one of those people who would plan my day around the Facebook game Farmville. I knew when my crops would spoil so I had to be there on time to harvest them. But unlike Farmville, in Stardew my crops didn’t wither in real time so its already a more relaxed experience. So on December 14, 2016 I set out to start my new life as a farmer. 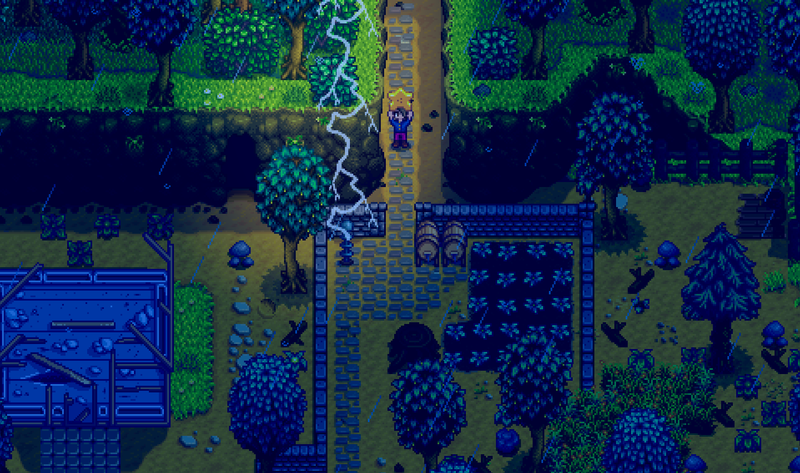 Ignore the lightning bolt, check out all the stuff on your brand new farm. The motivation to get players to the farm is a simple one. Your dying grandfather leaves his farm to you and encourages you to come run it when the 9 to 5 grind wears you down. A short cut scene later and there you are at Stardew Valley with Mayor Lewis to greet you. The place looks a hot mess when you get there with scattered debris, sticks, grass, etc all over the place. As a new farmer you have a whole lot of work to do. Working on the farm makes time pass and your energy will deplete with each action. Upgrading your tools will help to consume less energy and eating Starfruit will increase your energy bar. These are all things you will learn as the game opens up and explains them to you.